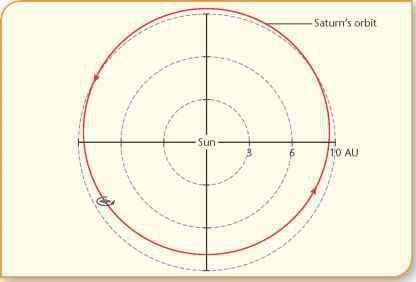 Figure 10.4 Orbital path of Saturn (distance circles are in astronomical units, AU). just over 1430 million kilometres, placing it about 9.5 times further from the Sun than is Earth. It travels around the Sun once every 29.46 years and rotates on its axis with a period of 10 hours 40 minutes. As with Jupiter, the short rotational period has resulted in Saturn becoming flattened or oblate. The equatorial diameter is 120 536 km, which is 10 per cent more than its polar diameter of 108 728 km. This shape suggests the interior is a liquid rather than a solid or gas.